My favourite theatre fundraiser of the year is always Spur-of-the-Moment Shakespeare Collective’s Shakesbeers Showdown. It’s a raucous competition wherein Shakespeare performers (and scholars and reviewers) attempt to read from the first folio while getting progressively tipsier (they have to drink every time they make a mistake, which of course makes them make more mistakes). I attend the show every year and live-tweet the proceedings. As a seasoned Shakesbeers audience member, I feel it’s my duty to pass on a few tips for first timers braving their first competition. Research who’s playing this year (the companies and their chosen representatives). Like any sport, the competition is way more interesting if you have a rooting interest and a sense of the players’ backstories. Knowing who’s a text-focused folio nerd and who’s a giant ham known for taking liberties will give you a leg up on predicting the winner. Remember that actor who played the best Hamlet you’ve ever seen a few years back? He’s about to get really drunk and sound like he’s never spoken the verse in his life. Maybe that really good Bolingbroke will stage a coup and declare himself the victor; you know the guy who played Iago is going to cheat. Root for a company who does the kind of work you like to see, or just pick whomever seems like someone you’d like to grab a beer with. Every team has an assigned colour so figure out who you’re rooting for and show up dressed to show your support. A little empathy goes a long way. If you’re drinking in solidarity, you’ve gotta know your f’s s’s u’s and v’s. The show also just makes a lot more sense if you know how the folio works and maybe recognize some of the text that’s getting mangled. Besides, you can’t mock the players if you’d do a lot worse. 3) Know what it’s for. Shakespeare in Hospitals is a great program that takes emerging and established artists into a discussion and creation period to build a narrative out of the whole canon and then some. The resulting performance is toured to hospitals bringing live performance to those who can’t seek it out themselves. The cost of your ticket and any money you spend at the Showdown helps make that program happen. Get ready to cheer, boo, laugh, heckle- pretty much any good faith noisemaking is fair game. And make sure your phone is charged. You’ll want to tweet your thoughts on who should advance each round and call your shot on who will win by using the hashtag #ShakesbeersShowdown. There are also silly hats and various shenanigans that Instagram will absolutely need to know about. 5) Settle in and have fun. It’s a long show- bring cash for the bar and pick a comfy seat with a good view (and, again, charge that phone). But if you go in prepared to be there awhile, get into the spirit of goofy nonsense and unabashed Shakespeare nerdom, and go with the flow, you’ll find yourself carried away in no time until you’re multiple hours and many drinks in, losing your mind at the utter absurdity of something appropriately titled “The Fool’s Round”. 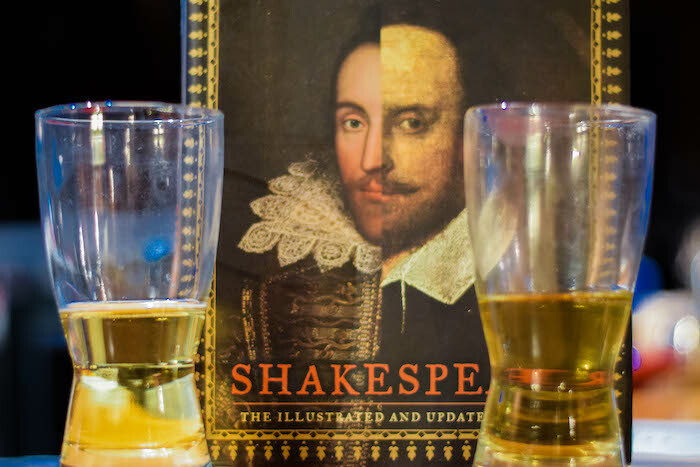 The 2019 Shakesbeers Showdown happens on May 5th. Get your tickets HERE.